When the Buffalo Bills Head Coach Sean McDermott was the Defensive Coordinator for the Carolina Panthers he had one of the best linebacker corps in all of the National Football League. That group was led by perennial All Pro Luke Kuechly in the middle and Shaq Thompson and Thomas Davis outside. That group wasn’t the biggest group as compared to other team’s linebackers, but the common denominator was speed and instincts. They were capable of making plays all over the field on both the run and pass game. When McDermott came to Buffalo last year the linebacker group wasn’t close to being the same. The most productive player of the group was middle linebacker Preston Brown, who is a very good player but he lacked the physical traits that McDermott was looking for. Because of that, Brown was not re-signed when he became a free agent following the 2017 season. To get the type of player McDermott wanted at Mike the Bills had to trade up in the first round to select Virginia Tech linebacker Tremaine Edmunds. Edmunds doesn’t have the rare instincts that Kuechly has but this will come as he gains experience. Edmunds left school early and just turned 20 so he is still developing. Edmunds has more size and speed than Kuechly and his upside is unlimited. He’ll be a fixture in the middle of the Bills defense for years. AT the beginning of 2017 one of the starters outside was veteran Ramon Humber. Humber was a good player but lacked all the traits McDermott was looking for. Humber had to miss some time because of an injury and rookie Matt Milano stepped. His play won over the coaches and it wasn’t long before he became the starter. Milano is another who has very good speed and instincts. Humber is still around and will be an excellent backup to Milano. The third linebacker will be 12 year vet Lorenzo Alexander. Alexander looks and plays a lot younger than his 35 year old age. He has speed and is a very good pass rusher coming off the edge. Backing up Alexander is 2017 draft choice Tanner Vallejo who should show much improvement in his second year. The backup in the middle will be free agent acquisition Julien Stanford, who was with the Jets the last two seasons. Stanford is known for his special teams play but he is also very capable if his has to play because of injury to Edmunds. 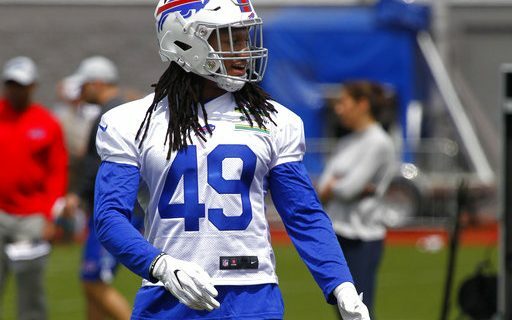 All told, with the drafting of Edmunds and the year of experience gained by Milano the Bills linebacker position group looks much better than it did a year ago. While it still may not be quite as good as what McDermott had in Carolina, it’s getting much closer. What will also help the linebackers is new defensive tackle Star Lotulelei. It was Lotulelei’s job to keep offensive lineman off the linebackers in Carolina and he will do the same in Buffalo. Greg Gabriel on the Bills defensive line, offensive line and wide receivers.